Hearts fans were entitled rub their eyes in disbelief as they checked the Premiership table for confirmation of their team’s lofty status following Saturday’s spirited win over Dundee. Only two years ago to the day, the administration-ravaged Tynecastle side languished on minus 15 points and were staring at the prospect of a sustained period in the doldrums, or possibly even extinction. No-one could have envisaged they’d be back at the top end of Scottish football anytime soon. Yet, here they were leaving Dens Park three points clear at the Premiership summit after making it two hard-fought victories from two games since returning to the top flight. This was a scenario to savour for the Jambos, even if they were subsequently pegged back by Celtic and Aberdeen, who joined them on the six-point mark yesterday. It remains to be seen if they can keep pace with last season’s top two for a sustained period, but early signs are promising. This is the first time since 2006 that they have won their opening two games of a top-flight season. A year ago, albeit in the Championship, Hearts eked out two narrow victories over Rangers and Hibs before going on to put together a run of 28 points from a possible 30 which laid the foundations for a runaway title success. Ten years ago, George Burley’s team won their first eight games before famously splitting the Old Firm. With their next four games against sides tipped for the bottom six – Motherwell, Ross County, Partick Thistle and Hamilton – it’s not impossible that Hearts could be heading to Inverness next month with 18 points from a possible 18. Not that anyone at Tynecastle will publicly entertain that prospect. Asked if Hearts could carry a challenge to Celtic, midfielder Morgaro Gomis, a key man in his side’s second-half fightback at Dens, laughed dismissively. “It’s good to start well but it’s a long season and we’re not going to get carried away,” he said. “We’ll take it one game at a time but getting points on the board helps us. Like the 2005 side, who had Rudi Skacel as a talisman, the current team’s cause is being aided significantly by a new recruit who has wasted no time in establishing himself as the darling of the Hearts support. Juanma Delgado’s name was being sung with gusto by the 2300 away fans at Dens as the two-goal, match-winning hero left the pitch to be replaced with ten minutes left. His first, in the 56th minute, was a clinically-struck penalty – no mean feat for a Hearts player after last season’s woes from the spot – and the second, seven minutes later, a brilliant goal after he nicked possession just outside the box, stepped superbly inside his countryman, Julen Etxabeguren, and finished ruthlessly past Scott Bain from seven yards. This second-half contribution made amends for a dire first-half miss, when he sent a free header past from close range, at a time when Dundee were a goal to the good and threatening to run away with the match. Juanma has now scored three goals in his first two league games. At half-time on Saturday, it was hard to see Hearts leaving Tayside with three points. They were outplayed for long periods of the first half by a scintillating Dundee side intent on building on their opening-day demolition of Kilmarnock. Hearts head coach Robbie Neilson had been impressed by the Dark Blues’ forwards in that 4-0 Rugby Park romp and decided to move captain Alim Ozturk from his regular centre-back berth into a midfield holding role to try and nullify their attacking threat. This also allowed the much-hyped new recruit, Juwon Oshaniwa, to come in for his debut at left-back, with Igor Rossi moving into centre-back. Hearts looked uncomfortable from the outset, however, and found themselves clinging on for much of the half. Dundee went ahead in the fifth minute when, from a corner, Greg Stewart played a one-two with Paul McGowan and clipped in a cross which was glanced in by the unmarked Kane Hemmings, who had been denied by Neil Alexander just seconds earlier. Although Dundee controlled most of the half, Hearts did spurn two big chances. 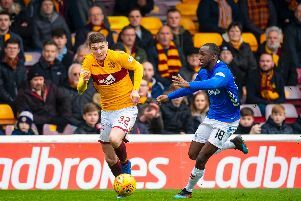 The first fell to Jamie Walker in the 13th minute after Juanma cushioned a Prince Buaben cross into his path, but the 22-year-old, with just Scott Bain to beat, was denied by the goalkeeper before heading the rebound over. Alexander had to pull off excellent saves to deny McGowan and Kevin Holt, either side of Juanma’s 37th-minute miss, while Gary Harkins also blew a great chance for the rampant hosts. Unsurprisingly, Neilson reshuffled the Hearts pack at the interval, with Ozturk moved back to centre-half, Rossi out to left-back and Oshaniwa up to left midfield. The complexion of the game changed significantly, with the visitors seizing a foothold and simultaneously taking the sting out of Dundee’s attack. After a bright opening to the second half, Hearts levelled when former Hibs captain James McPake was adjudged to have handled during a melee in the box, Juanma sending Bain the wrong way. Seven minutes later, the Spaniard scored what proved to be the winner, and, with their tails up, Hearts were able to see out the victory in relatively comfortable fashion. Gomis felt the second-half improvement owed as much to a half-time rollicking from Neilson as it did to the tactical tweaks.